I've just started the design of a new home in the Blue Ridge Mountains of western Virginia. The property, more than 5 acres, is spectacular -- heavily wooded, with a change in elevation of almost 100 feet from front to back. As the land slopes away, the treetops drop down revealing mountain and forest vistas and a stream in the valley below. As part of the design process, we looked at classic American mountain houses built from the 19th century onward. From the Adirondacks to the Blue Ridge Mountains and beyond, there's a specific aesthetic for a house in a wooded and mountainous site. Big and simple gable roofs reflect the shape of the mountains while easily shedding rain and snow. Big, tree-like timbers, often used as found on the site, support these roofs. All of this rests on local stone formed into foundations, plinths and chimneys. The metal plates and anchors joining these elements have a heft and scale to match the surroundings. These homes situated in the wild have given up the refined elegance, gentility and constraints of the city. They are raw, natural and massive. And it's this massiveness, this scale, that is most intriguing about these homes. Built in the land of giants where mountaintops touch the heavens, trees reach for the sky and lakes appear bottomless, these homes can hold their own. Like big tents, the big and simple gable roofs on these homes define a place of shelter and reflect the landscape of trees and mountains. Stone chimney, stone plinths and stone base anchor this house to its site while the roof, like a great tent structure, is supported on tree-like poles. These metal roofs are definitely tent-like, stretched taut like fabric over a simple pole-like structure, seeming to float above the land. Large expanses of glass keep the interiors light and bright while capturing the property's best views. With multiple outdoor spaces and perched at the edge of the water, this has to be a fisherman's dream home. 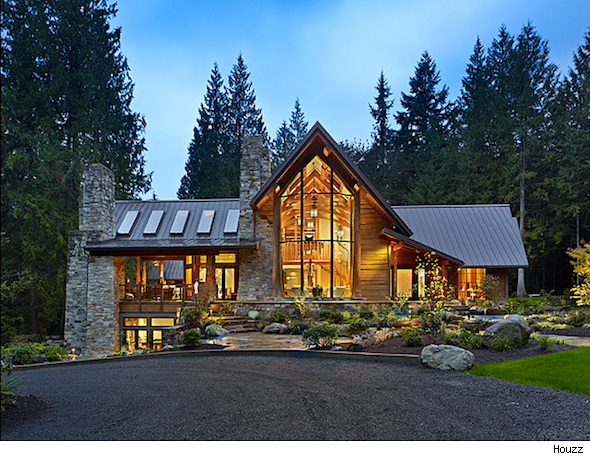 See more mountain homes on Houzz.